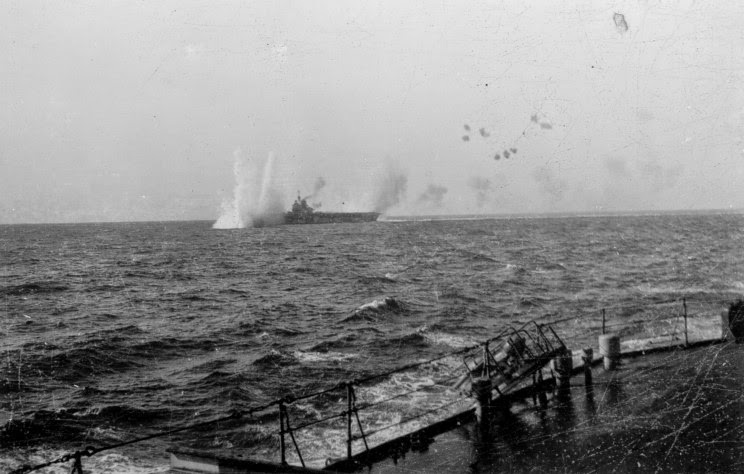 Illustrious under attack by German Bombers. The first Luftwaffe elements had arrived in Italy in January 1941 to support the Wehrmacht’s incipient invasion of Greece. The primary targets for German aircraft would always be Malta and the pesky enemy convoys and fleets that were keeping the stubborn little island alive. Supplying Rommel’s growing Afrika Korps from a few crowded Italian ports and even more unsatisfactory North African receiving wharfs would be extraordinarily difficult. The problem was compounded both by Hitler’s decision that this front, like all others, should be marked by movement and action, not defense, and by Rommel’s own dashing style of generalship that demanded frequent offensives with consequently heavy drawdowns on limited fuel stocks. Malta sat firmly astride the Italian–North African supply route. Planes, surface ships, and submarines operating from the island could not be allowed to cut that route, thus disrupting the always fragile but highly promising German offensives against Egypt and Suez. Malta had to be neutralized. Meanwhile, the remainder of Cunningham’s force, now bereft of air cover, was attacked unmercifully by enemy dive-bombers. Cruiser Gloucester was slightly damaged, while its sister, Southhampton, was struck in the engine room and had to be abandoned. Taranto had proved that used imaginatively and stealthily, carriers could kill battleships and thus win control of the high seas for their navy. But the fate of Illustrious suggested that the strategic role of carriers as both power projectors ashore and fleet-defense vessels was sharply circumscribed whenever confronted by land-based airpower. 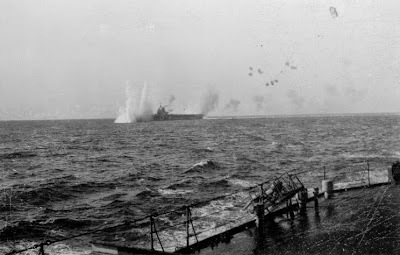 Carriers were apparently incapable of protecting either themselves or the ships around them from determined dive-bombing attacks. Fortunately for Cunningham, Illustrious’s newest sister, Formidable, was available for service and arrived at Alexandria in March at just the moment when the eastern Mediterranean Fleet was about to undergo its first real ordeal. The admiral was by this time fully cognizant of the terrifying capabilities of airpower. Even with two carriers (Eagle and Formidable), a few RAF squadrons scattered around North Africa and Greece, and Ark Royal occasionally on call from Gibraltar, British aircraft could not be everywhere. As the Eighth Army tried to clear Rommel and the Afrika Korps out of Tobruk in early 1941, the German and Italian air forces pummeled supporting British warships unmercifully. Cruiser Terror and destroyer Dainty went down together with several smaller ships. It was a foretaste of horrors to come.